If you’re like me, you feel helpless after hearing about the recent disasters in Japan and its thousands of victims. Well, feel helpless no more because one local boutique is helping you to make a difference one wardrobe staple at a time. 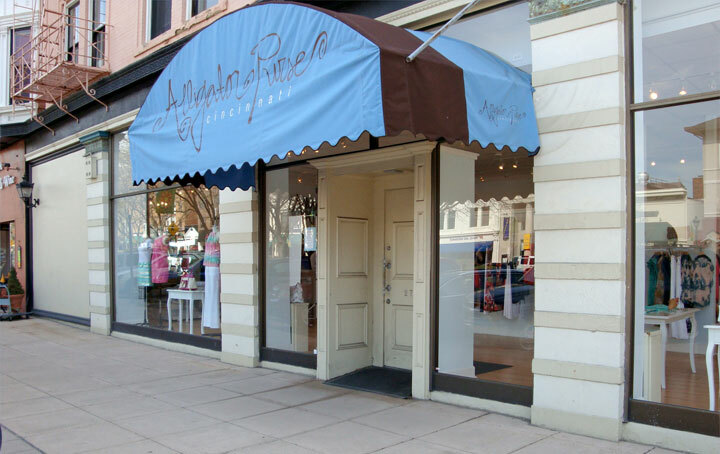 Alligator Purse is asking for your help (click here to read a story Cincy Chic just wrote about AP). They are asking for your help to come together as a community to help the victims through Mathew 25: Ministries, an international humanitarian aid and disaster relief organization. Helping out is easy, fun, and fashionable! For every $100 you spend in the store they will send supplies, such as first aid supplies personal care products, cleaning supplies and food staples. It won’t be hard to find something you want to add to your closet, considering they have tons of new looks for this spring! If you want to really stand out at the next cocktail party you attend, Alligator Purse has new spring dresses, like a salmon colored wrap dress with a leather beige belt to show off a slim waist (VERY chic!). April showers bring May showers, right? Well April’s upcoming showers have also brought floral patterns to Alligator Purse, with a strapless flowy dress, or a very trendsetting floral ruffled wrap dress. Did you just get back from a spring vaca and want to show off your new sun kissed glow? Well, a vibrant coral strapless dress will do the trick! For the younger chic customers, the shop also has a few one shoulder looks, and the perfect tops for going out from Rebecca Taylor. Not to mention dresses in hot pink floral on grey, grey metallic print, and a crème off-shoulder sash belted dress–complete glamour! What’s a better excuse for shopping than knowing you are helping out the victims in Japan? The best day to help out would have to be tomorrow, for their awesome sale: “Thursday Dash.” The sale will be from 10 a.m. to 6 p.m. tomorrow evening. Come stop by their shop, the sale is in-store only, to get 15% off their two favorite designers, See by Chloe and Theory, and don’t forget to check out their new markdowns that are pretty hard to beat! Those of you that are interested in helping out take at their website (click here) to get more of an idea of what the shop offers, and come into their shop located on Erie Ave. I hope you all can try to help with this great cause! Since the time us women started watching Disney movies, we all had started to think about our prince charming, what our weddings would look like, what kind of castle we would live in, and most importantly, what our dream wedding gown would look like. 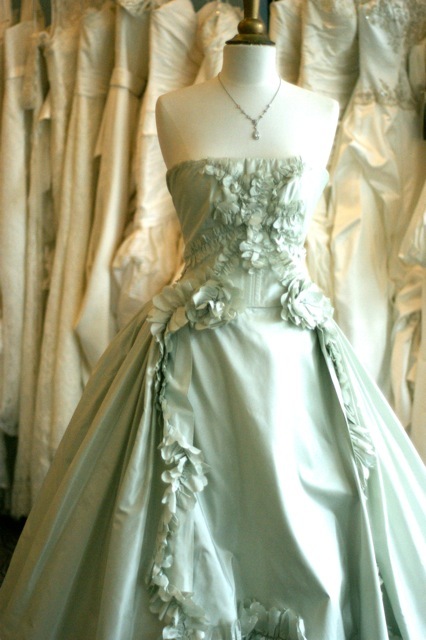 To this day, the bride always wants the best gown for her big day; she wants to outshine everyone in the room. After trying on dozens of dresses she finds the perfect designer gown that fits her like a glove, only to find that the gown is way out her budget. Sound familiar? Well, with March coming to an end, spring is revving up and wedding season is about to start. Carolina Herrera is about to make a dream come true for brides-to-be in the Cincinnati area with her designer wedding gowns that will be available at her trunk show on Friday and Saturday. She is the real deal. Having dressed many celebs such as Renee Zellweger, and being named one of the 7 Most Influential Bridal Gown Designers of our time, I would venture to say she is quite a big shot! You might be thinking that this sounds unrealistic to you, but there will be dresses from $18,000 being sold for as low as $4,000—HELLOOO, that is a HUGE deal! European Bridal is the only bridal salon in the Cincinnati area that carries Carolina Herrera, so if you miss out on this, don’t expect to find her gowns anywhere else, especially at such amazing prices. Be sure to call and make an appointment at (513) 821-6595, even if it is just to browse the fabulous 18 dresses that will be in the store. There ain’t no shame in trying on a wedding dress worth $18,000? The little princess that’s still inside all of us needs to come out sometime! To say I’m excited about today’s Eco-Fabulous Fashion Show is an understatement. First of all, I brought on two national clients for it (Vitamin Water Zero and Lexus). Second of all, we have 350 RSVPs and it’s sold out. Third of all, it’s benefiting the Civic Garden Center which is an amazing organization making our city pretty. And lastly…. it’s going to just be a ton of FUN! 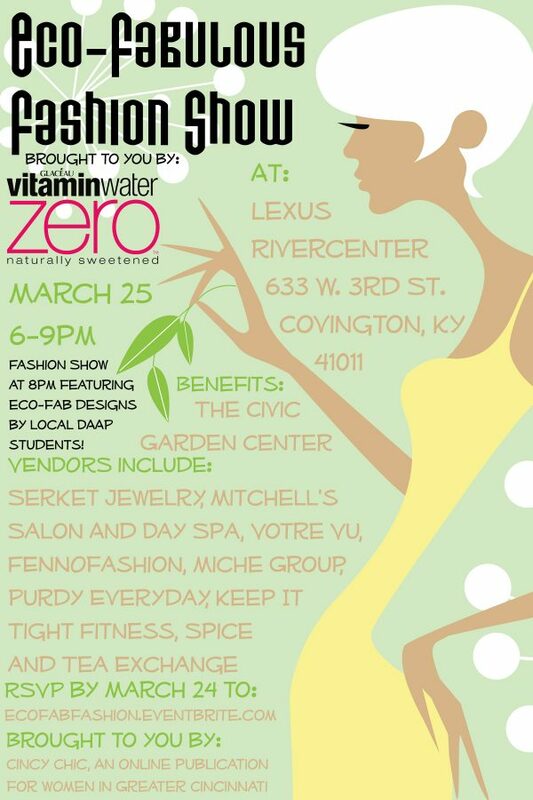 There will be food, drinks, music, shopping and a eco-fab fashion show with clothing made out of re-purposed materials. 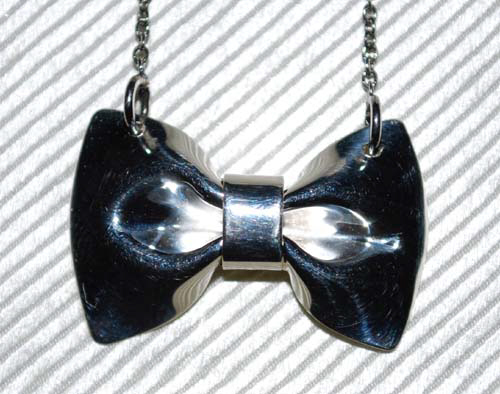 And the jewelry is also made out of re-purposed/recycled materials. The jewelry vendor, Serket Jewelry, sent me a sneak peek of some of the jewelry that will be in the show. The pics are just showcasing some of the jewelry that will be at the show. For a sneak peek of some of the clothes that will be in the show, check out the bottom of this post for a segment we did on Wednesday on Fox19! Hope you got your ticket to the event! We’re all sold out! 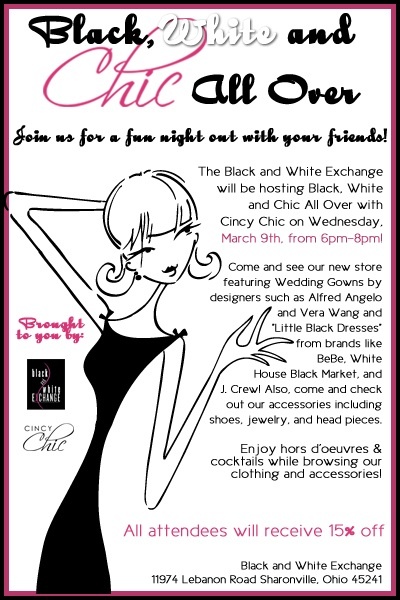 The next Cincy Chic event is “Night in White” on April 29, so save the date! Enjoy the pics and video! Model Brenna Nicole' Lee Principato (also model for Fox 19) is wearing a skirt made out of a variety of ribbons. The light blue top is made from a bed skirt. Jewelry: necklace is made from plastic lids that are on milk jugs, juice, etc then added chains and butterfly components. The headband is made from red bull labels. Model Nataly Silva is wearing a 2 piece dress; top is created from ladies fashion belts woven together then cut to shape the bodice. The layered green and gold skirt is made from curtains. The jewelry: necklace is made from the lid of a jewelry box with attached beads and the flower is made up of bridal flower pedals and rhinestones. 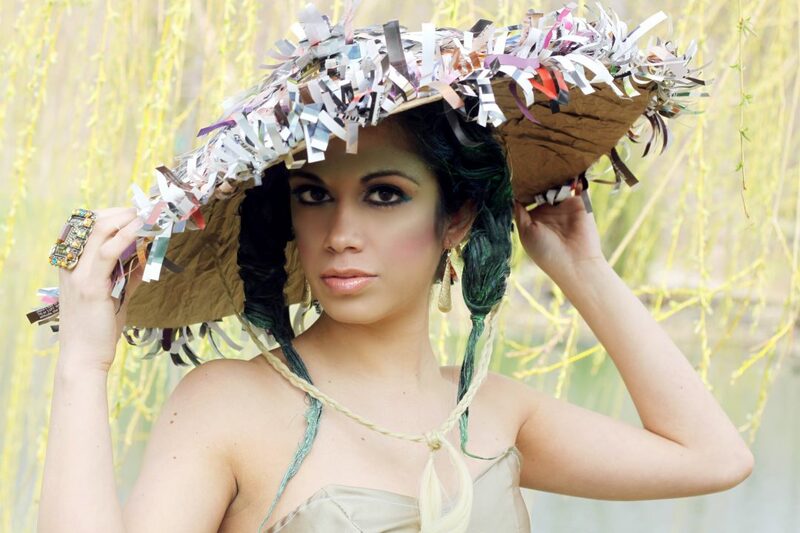 Fashion Show at 8pm, showcasing eco-fabulous designs from several local DAAP students. Drinks provided by Lexus Rivercenter. Food provided by Behle Street Cafe. After Party: Join us for the official after party at Behle Street Cafe. Complimentary parking in the rivercenter garage directly behind Behle Street Cafe. (left to right) Jenlain Coyle and Lily Schwartz, co-chairs of the event. 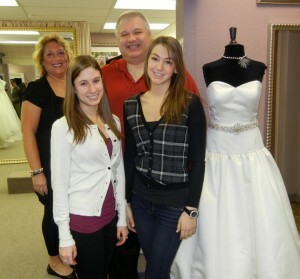 Lisa and Andy Star, owners of Bridal and Formal. If you’re looking for a fun event you can feel good about next month, Sycamore High School is holding their Fifth Annual Fashion For the Cure. Each year a local charity is chosen to be honored at the event and receive the money raised by the event. Last year, this event raised $11,000 for Pediatric Brain Cancer! This year, the selected charity hits pretty close to home. The event will be held in honor of Rob Stoneberger, a Sycamore teacher who passed away in 2009 from esophageal cancer. All proceeds will go to Cancer Family Care, a non-profit organization in Greater Cincinnati that helps families and individuals coping with cancer by providing them with various services and necessities. The event will include a student fashion show featuring clothes from local boutiques, raffle baskets and bid and buys. Sycamore High School athletes will be there to serve food and drinks. Co-chairs of the event are Jenlain Colye and Lily Schwartz, and Lisa and Andy Star, owners of Bridal and Formal. Doors open at 6:30 and the show starts at 7:30. Tickets are $10, or get a ticket and a t-shirt duo for just $15. Tickets can be purchased at the door. Thanks to my intern, Ashley Sohngen, for helping me put this blog post together! Art, Cocktails, and Fashion… three of my favorite things in life. Add chocolate to the list and I’m in heaven! So, if you want to get your own little slice of heaven, stop by this event. The fashion show will be featuring some skimpies from Knickers and Knickers XY (KXY). I wrote this story about KXY for Cincinnati Profile after it first opened. Click here to see pics of the KXY grand opening party! I could go on for days about KXY. I love it… it’s one of the only places I can get good shaving stuff for my hubby. I hear they’re going to be opening a clothing store right next door. More details on that to come soon… I’m trying to get a sneak peek in there. But I digress… back to the fab event tomorrow, it’s for a great cause, Visionaries and Voices! We recently wrote about Pam Kravetz (who happens to be my high school art teacher) who’s very involved with V+V and loves the organization dearly. Hope to see you there! This Friday a trunk show will be happening in Madeira, right in front of Kennedys and Romualdo’s. There will be everything from casual looks to office attire to cocktail dresses. The designers featured are White and Warren, Billy Blues, Zanella, Michael Starrs, Joes Jeans, Susie Roher belts, the list goes on. Click here for a sneak peak of all of the looks! And the best part is that everything is from $50-$350! New menswear trends were recently strutting the runways at New York Fashion Week, Cincinnati Profile (basically the male version of Cincy Chic) is having an event to launch its new online-only format and Corwyn Apparel (a local tie designer) is opening a new store in Springdale next week. You wont want to miss the Corwyn event if you’re in the market for new ties. 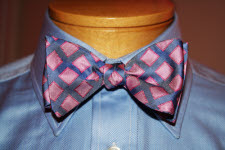 He’s doing a 50% discount on all neckties from his Spring 2011 collection! Below is a video from when I went on Fox19 to highlight some new menswear trends! Enjoy! One of the things I didn’t get to focus on much is the “swazer” the last model was wearing. 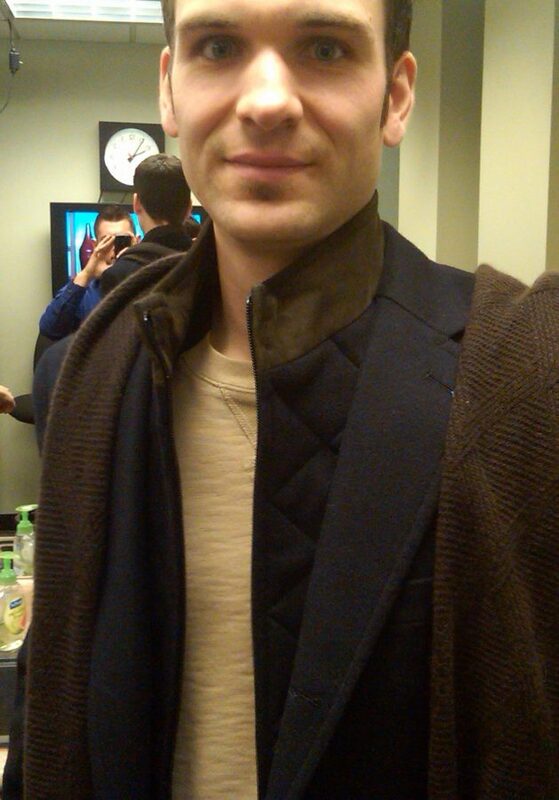 It was a blazer, but it was more of a soft, sweater material. It even had a detachable quilted, leather trimmed neck under the lapel, which I thought was interesting. So, it gives a more relaxed look to a blazer if you want it, or need the extra protection (with style) from the elements. Here’s a close up pic of the swazer. I got it at Nordstrom Rack for $129.